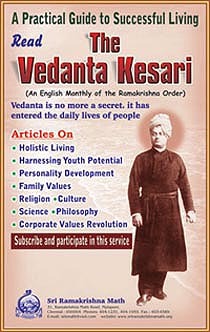 or "The Lion of Vedanta"
The Vedanta Kesari is an English monthly, published by Sri Ramakrishna Math, Chennai. Started in the year 1895 the 'Brahmavadin' assumed its present name 'The Vedanta Kesari' in the year 1914. It is devoted to spirituality and culture, and is a practical guide to successful living for the entire family. Under the inspiration of Swami Vivekananda, his Madras disciples G.Venkataranga Rao, M.C.Nanjunda Rao and Alasinga Perumal started the Brahmavadin on 14 September 1895.Until Alasiga's death in 1909 the magazine came out regularly. Even after his passing away it continued but with less regularity, and its last issue was the March-April 1914 number. The very next month (in May 1914) the Brahmavadin reincarnated as The Vedanta Kesari. It has had many learned monks as editors and has built up a good reputation for authenticity and scholarship. One of the oldest English religio-philosophic journals of India, it is devoted to spirituality and culture, and provides a feast of elevating and noble thoughts from all corners of the world. Thousands all over the world have discovered the secret of peace, joy and fulfilment through The Vedanta Kesari. It is a practical guide to successful living for the entire family and is read by an estimated 60,000 people from all over the world (http://www.sriramakrishnamath.org/Magazine/VK/VKhome.asp).